Analysis: It's quite a nice payout for Uzomah, who caught 43 passes for 439 yards and three TDs in his fourth NFL season. Given the lucrative terms of his new contract, it's clear that the Bengals view Uzomah as a big part of their offense for the next few years. Meanwhile, fellow tight ends Tyler Eifert and Tyler Kroft are set to become unrestricted free agents Wednesday. Analysis: Uzomah ends the season with 44 catches for 445 yards and three touchdowns. He took over when Tyler Eifert and then Tyler Kroft got hurt, but then his potential to produce more got crushed after Andy Dalton got hurt. It's uncertain what the Bengals plan to do with Eifert this offseason, which obviously impacts Uzomah. Analysis: Uzomah tied for the team lead in targets, but he struggled to get on the same page as quarterback Jeff Driskel. His 27 receiving yards were good enough for second among Bengals pass catchers, though that's more of a negative reflection on the current state of the team's offense. Uzomah has topped 40 receiving yards just once in the last eight games and is a middling fantasy option next Sunday even in a favorable matchup with the Browns. Analysis: Uzomah hasn't scored since Week 7 against the Chiefs and has been targeted twice in the red zone since that TD. Even with Tyler Eifert (ankle) and A.J. Green (foot) out, Uzomah hasn't been much of a fantasy force. 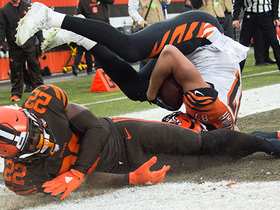 Uzomah turned 13 targets into six catches for 39 yards in Sunday's 35-20 loss to the Browns. Analysis: Uzomah was heavily involved in the offensive game plan, but the tight end was only able to muster an average of three yards per target. 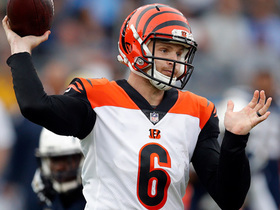 Quarterback Andy Dalton exited this one with a thumb injury but backup Jeff Driskel was able to command the offense effectively, so Uzomah's outlook against the Broncos in Week 13 should remain stable regardless of who's under center. Uzomah had three catches for 41 yards on five targets in the Bengals' loss to the Ravens on Sunday. 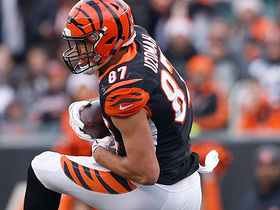 Analysis: Even with Tyler Eifert and Tyler Kroft both on IR, Uzomah hasn't had a big-target game in recent memory. In fact, it was unheralded backup Matthew Lengel who caught a touchdown pass in the game rather than Uzomah. Uzomah caught three of four targets for 23 yards during Sunday's 51-14 loss to New Orleans. Uzomah (clavicle) practiced fully Friday, Katherine Terrell of ESPN.com reports. As a result, he does not carry a Week 10 injury designation, per Paul Dehner Jr. of The Cincinnati Enquirer. 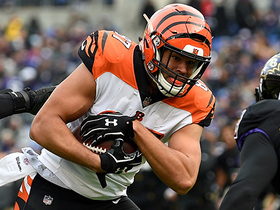 Analysis: The tight end's fantasy production has been sporadic, despite Uzomah having taken on an expanded role due to injuries to Tyler Eifert (ankle/IR) and Tyler Kroft (foot). That said, Uzomah's opportunities could pick up Sunday against the Saints, given that the Bengals will also be without top wideout A.J. Green (toe), who has been targeted an average of 9.5 times per game this season. Uzomah (clavicle) was listed as a limited participant during Thursday's practice, Jay Morrison of The Athletic reports. Uzomah (clavicle) logged a limited practice Wednesday, Paul Dehner Jr. of The Cincinnati Enquirer reports. Analysis: Uzomah is thus trending toward playing Sunday against the Saints, barring any setbacks over the next few days. The tight end's production has been spotty despite him taking on an expanded role in the wake of injuries to Tyler Eifert (foot) and Tyler Kroft (foot), but if healthy, his opportunities could pick up in Week 10. The Bengals will be without the services of top wideout A.J. Green (toe), who has been targeted 9.5 times per game this season. Uzomah (shoulder) practiced Wednesday, Katherine Terrell of ESPN.com reports. 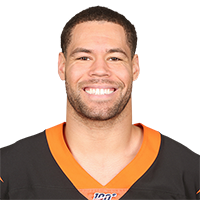 Analysis: Uzomah may end up being listed as a limited participant, but his presence for the Bengals' first official practice coming out of a bye week bodes well for his chances of playing Sunday against the Saints. His availability would be a boost to the team's passing attack, which will be tasked with making up for the absence of top wideout A.J. Green (foot). Uzomah (shoulder) didn't practice Monday and said he likely will take it easy this week, Katherine Terrell of ESPN.com reports. Analysis: Uzomah doesn't seem to be worried about his availability for Sunday's game against the Saints, as he mentioned that a Week 9 bye helped with the healing process. He could be a big part of the Week 10 game plan with Cincinnati already thin at tight end and now likely without A.J. Green (foot). Uzomah, who failed to come up with any of his four targets during Sunday's 37-34 win over the Buccaneers, was temporarily sidelined by a shoulder injury during the contest, Katherine Terrell of ESPN.com reports. 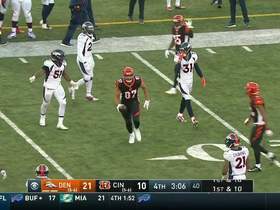 Analysis: The Bengals' one healthy tight end saw that status in peril during the game, when he appeared to have suffered a shoulder injury. Although Uzomah did return to the contest, he finished without any receptions in the high-scoring affair. The 25-year-old had a three-game streak of multiple receptions snapped and will now have a Week 9 bye to rest up before a Week 10 battle against the Saints. Because Uzomah is the only remaining tight end on the Bengals that began the season on the active roster, he's no longer able to play special teams for them, despite being second on the team in tackles there last season, Geoff Hobson of Bengals.com reports. Analysis: That's one of the reasons why the team's coaching staff is so excited about new addition Jordan Franks, who will give them another special teams option. While this nugget doesn't register much for fantasy players, at least directly, it does prevent one path for Uzomah to get injured or lose snaps. Uzomah hauled in both of his targets for 13 yards and a touchdown Sunday in the Bengals' 45-10 loss to the Chiefs. Uzomah (shoulder) doesn't carry an injury designation into Sunday's game against the Chiefs after logging a full practice Friday. Analysis: With Tyler Kroft still sidelined by a foot injury and Tyler Eifert (ankle) on injured reserve, Uzomah will handle the overwhelming share of snaps at tight end until further notice. 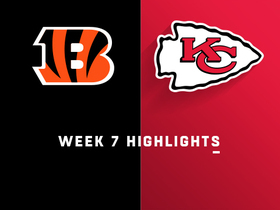 The 25-year-old turned in his most productive game of the season in the Bengals' Week 6 loss to the Steelers, hauling in six of seven targets for 54 yards. Uzomah (shoulder) was listed as a limited participant in practice Thursday, Paul Dehner Jr. of The Cincinnati Enquirer reports. Analysis: Uzomah's participation level marks no change from Wednesday, but the expectation remains that the tight end will be ready to suit up by the time Sunday's game in Kansas City arrives. He'll continue to have a clear path to the bulk of the snaps at tight end with Tyler Kroft (foot) already ruled out and Tyler Eifert (ankle) on injured reserve. Uzomah was limited at practice Wednesday due to a shoulder issue, Geoff Hobson of the Bengals' official site reports. Uzomah caught six of seven targets for 54 yards in Sunday's 28-21 loss to Pittsburgh. Analysis: Uzomah ranked third on the team in catches, targets and receiving yards. Unsurprisingly, wide receivers A.J. Green and Tyler Boyd finished ahead of the tight end in all three categories. Uzomah and the Bengals will face Tennessee in Week 7. Uzomah caught both of his targets for 43 yards in Sunday's 27-17 win over Miami. 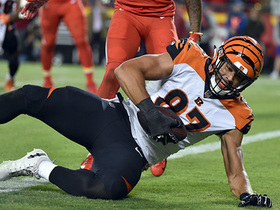 Analysis: Uzomah outplayed fellow tight end Tyler Kroft (zero catches, one target) in the team's first game without Tyler Eifert, who was placed on IR with an ankle injury. Kroft also got hurt in the game and might not be able to go next week. While Uzomah will benefit from Eifert's absence, don't expect him to match the usual starter's production. He'll face the Steelers at home in Week 6. 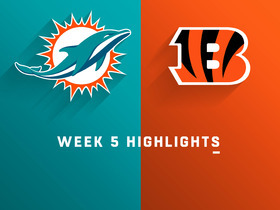 Uzomah is expected to serve as the Bengals' primary tight end in Sunday's game against the Dolphins, Katherine Terrell of ESPN.com reports. Uzomah caught his lone target for six yards in Sunday's 37-36 win over the Falcons. He was in the game for 51 snaps, as opposed to only 20 for Tyler Kroft. Analysis: Uzomah wasn't a big part of this win, but he and fellow tight end Tyler Kroft should both play greater roles moving forward after starter Tyler Eifert suffered what could be a season-ending ankle injury. Through four weeks, Uzomah has seven catches (one touchdown). He'll face the Dolphins in Week 5. Uzomah caught both of his targets for 19 yards and a touchdown during Sunday's 31-21 loss to the Panthers. Analysis: Not only did Uzomah find the end zone, he also saw significantly more snaps than second-string tight end Tyler Kroft. Uzomah has been more involved in the passing game than his counterpart, while still ceding targets and snaps to Tyler Eifert. The 25-year-old out of Auburn has six catches for 68 yards and a score through three games. Uzomah secured three of four targets for 45 yards in the Bengals' 34-23 win over the Ravens on Thursday. Analysis: Although he was outpaced by starter Tyler Eifert by 12 snaps Thursday, Uzomah was the more productive of the two. The fourth-year pro showed some upside as a pass catcher two seasons ago with a 25-234-1 line over 10 games, and with the Bengals looking to preserve the injury-prone Eifert for all 16 games, Uzomah could see his fair share of playing time and targets between the 20s throughout the campaign. Uzomah had one catch for seven yards on two targets in the Bengals' season finale win over the Ravens. Analysis: Uzomah had six of his 10 catches over the last three games, including his single touchdown reception. Tyler Eifert will be back, at least for a little while, next season so Uzomah will revert back to the third tight end on the team. Uzomah had a season-high four catches for 24 yards on four targets in Sunday's loss to the Vikings. Analysis: Additionally, Uzomah's 23 offensive snaps were a season high. He benefitted some from the Bengals' healthy scratch of Tyler Boyd, at the expense of receivers Josh Malone and Alex Erickson, as the team often went with two tight end sets. Cincinnati Bengals tight end C.J. Uzomah makes a tough grab over the middle for a 27-yard gain. Cincinnati Bengals tight end C.J. Uzomah brings down a 20-yard catch vs. Denver Broncos. Cincinnati Bengals tight end C.J. Uzomah makes great adjustment for back-shoulder catch. 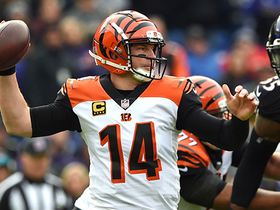 Cincinnati Bengals quarterback Andy Dalton lofts pinpoint dime to C.J. Uzomah for 20-yard catch. NFL Media's Senior Fantasy Analyst Michael Fabiano gives his list of quarterbacks and tight ends you should start and sit in Week 8. Cincinnati Bengals tight end C.J. Uzomah catches a 4-yard touchdown from quarterback Andy Dalton.